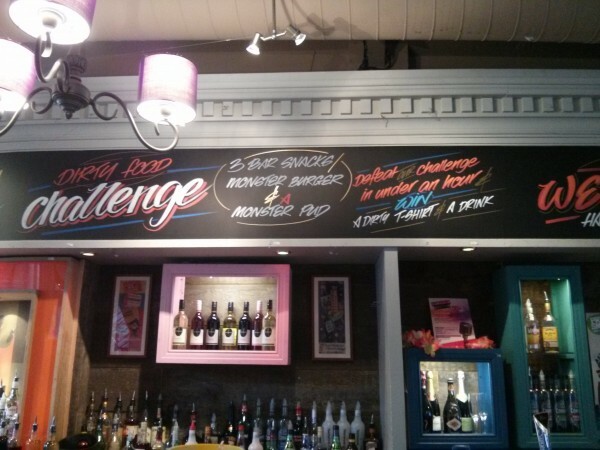 This is a new challenge at the Varsity Pub at the top of West Street in Sheffield. 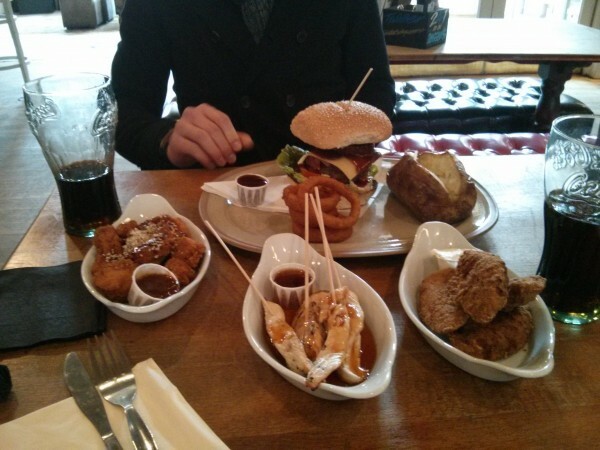 The challenge is to eat 3 bar snacks, a monster burger and a monster pudding. Defeat the challenge in under an hour and win a Dirty T-shirt and a drink. My initial thoughts were that it’d be quite simple. The only worrying thing was the size of the bar snacks. If they were huge then it could be problematic. The other thing is that they give you a full hour to finish it. It should be a hefty amount of food if they give you a full hour. I figured that the chicken dishes would be small in volume so I went for the sticky chicken skewers, southern Fried chicken strips and sesame chicken bites. The Monster Burger is two hand pressed own recipe burgers, chargilled to perfection, with bacon, cheese & BBQ sauce, served in a sesame seeded bun with our thyme mayo on the side, chips & beer battered onion rings. The price was £8.99. When I ordered it, I was asked whether I wanted chips or jacket potato with the burger. I took Randy Santel’s advice. Basically, if you chose chips, the restaurant can put as many chips as they want on. (Thats what did me on the 40oz steak challenge) With the jacket potato, you get one and even if its big, its not going to be as big as a large plate of chips. 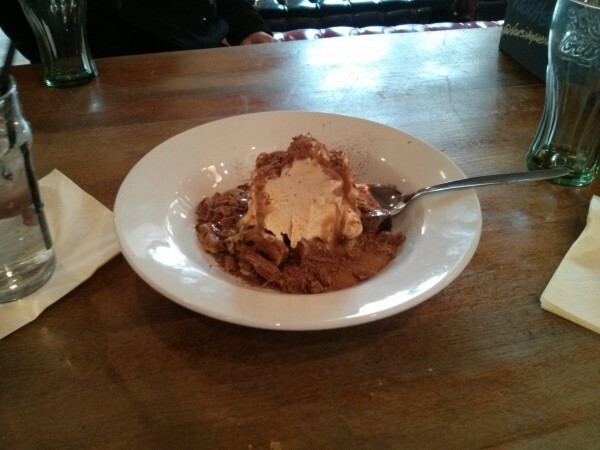 The Monster Pudding is Crumbled cookies, chunks of chocolate fudge, cake & sticky toffee pudding with ice cream, toffee flavoured sauce & crumbled flake. Sounds big but at just £4.50 its not going to be a monster. The whole challenge came to £20.49. Its quite clever marketing I think. They have to give away a drink and a t-shirt but they sell £20+ worth of food + drinks. As you can see, the burger isn’t that big at all. I was just thinking this is a ridiculous. Everyone thats going to attempt this challenge is going to complete it in an hour. They really need to be piling on the chips and onions rings to make it a challenge and cut the time down. 4 onion rings is a joke. Needless to say I breezed it. I ate at a leisurely pace and managed to complete it in 28 minutes. If I was racing, I could have easily knocked a load off time off that but I thought I’d enjoy it. The challenge is new so the T-shirts weren’t ready. I’ve got an IOU for it. I’ll update the post later when I get the T-shirt. Overall it was a nice experience but not challenging at all. The bar lady, Rebecca, was nice and apologetic about it and listened to my feedback. If I was doing it, it’d be a 20 minute time limit, 1kg chips and a dozen onion rings. I wouldn’t bother with a free drink, I’d just dish out a T-shirt, certificate and an option of appearing on their facebook page. I’d have a hall of fame, a hall of shame and an all time leader board. I’d probably do the challenge multiple times to try get a good score on the leader board but at the moment, I’d don’t think I’d bother doing the challenge again. The Flaming Grill Challenge is cheaper and harder. To summerise, its not really a challenge in its current state. Nice food and it’ll fill you up but as its so easy, there’s no sense of achievement. This one sounds like one for Mike. A Dirty food challenge T-Shirt would really suit him.